Contact our PartyMojo office at 65696992 or Sales 81606655 / Yolanda 81606622 to enquire now! Drop us a quick email at [email protected] today for your very own Chipolatas Live Station! You have to admit that anything French nowadays just feels classy especially when most of the luxury brand products in the market are of French origin. Similarly, when you give sausages a fancy French name like Chipolatas, sausages just don’t feel like mere sausages served with toast and scrambled eggs on the breakfast table anymore. You are not mistaken, Chipolatas are sausages but then again just more sophisticated. Want to add some class to your next event? Well, why not consider having PartyMojo’s Chipolatas Live Food Station and impress your guests with some fine French food! Simply provide us a table and a powerpoint and we’re good to go! Tables are available for rental at $20 too!! Ever been to one of those food festivals with small independent stalls serving an exotic array of international cuisines? Such events usually adopt a more casual al fresco dining style where guests could just be standing by some bar tables chit chatting and eating with their bare hands. Fancy such a fine ambience for your next event? Consider having PartyMojo’s Chipolatas Live Stations to help you with it! Chipolatas can be served casual like on disposal plates but still giving your guests a taste of exotic foreign cuisines, the perfect choice if you want an event to be laid back but special at the same. So wait no more and add some Chipolatas flavour to your next event! We promise it won’t look cheap despite its name. Chipolatas are essentially sausages but made smaller, thinner and spicier. The sausages are sealed and frozen while being transported to your event so that they are kept fresh to be prepared as Chipolata sausages later. The Chipolatas Live Stations at your event will have our friendly and efficient Mojo SuperStaffs grill Chipolata sausages right in front of you whenever you approach them for an order! Yes, you can have as many of them as you wish! Sounds exciting and satisfying? Well wait no longer and get the Chipolatas Live Station today! Why have Chipolatas at your event? Chipolatas might not be as common or popular as nuggets, drumsticks and fries at parties but it could be a pretty fancy snack to be added to the list given the rich culture and heritage that accompanies it. The sausages are really convenient to nibble at too. Dip them in hot tomato sauce or have them just the way they are, they won’t lack flavour with that honey-glazed skin. Contact PartyMojo today and give our Chipolatas Live Station a try at your next event! Chipolata technically originated from France but it’s much more diverse than you think it is and here’s why. The French term was derived from the Italian word Cipollata. 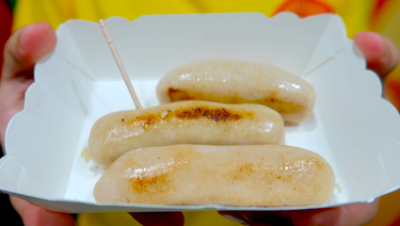 Chipolata also has different renditions peculiar to individual countries such as how it’s regarded as part of a Christmas dinner in the UK and a type of breakfast sausage in Australian and New Zealand. Fascinated by its rich heritage and cultural diversity yet? Bet you just got more interested in having it catered for your next event! Enquire with PartyMojo today at 6569 6992 or 6569 6998 about catering our Chipolatas Live Station! A 50% non-refundable deposit is required to confirm the event. Breakage and damages to any equipments will be charged to customer accordingly.All cheques are made payable to PARTYMOJO PTE LTD.
Postponing of event is subjected to a $100 – $150 surcharge, subjected to availability, otherwise, client can choose to cancel the event and deposit paid will be forfeited. PartyMojo reserves the right to cease the party immediately if any of our staffs are verbally abused by the client. In the event that a PartyMojo staff is verbally abused by the client’s guest, PartyMojo staff will inform the client immediately. If the abuse does not cease, PartyMojo reserves the right to leave the event immediately.